When I first saw the wonderbag, I had to order it. You can read about my first meal using it here. Whilst waiting for it to arrive, I came across a couple of people in the comments section on a few review sites who expressed concerns about wonderbag potentially keeping meat/rice warm and becoming unsafe. So, I thought I would see what I could do to test this. 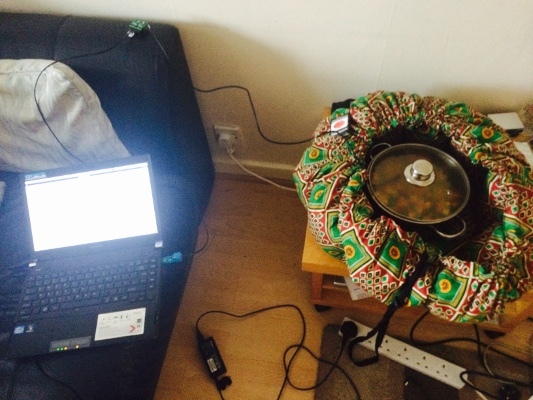 With my raspberry pi in hand, a DS9490R USB Host Adapter, SWE1 Temperature Sensor and SWE0 Temperature Sensor from Sheepwalk Electronics, I set to work cooking. 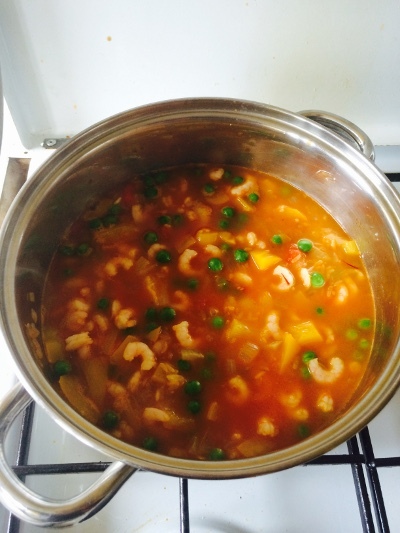 Since I had everything to make a seafood paella, see recipe, I thought this would be a good thing to make. From here, you can explore the /mnt/1wire directory which contains the MAC addresses of the two temperature sensors. one on the SWE1 and the other on the SWE0. In each directory, there is a file called temperature which contains the recent temperature for that sensor. So, just cat the contents of each temperature file into a results file via a cronjob and plot using gnuplot. 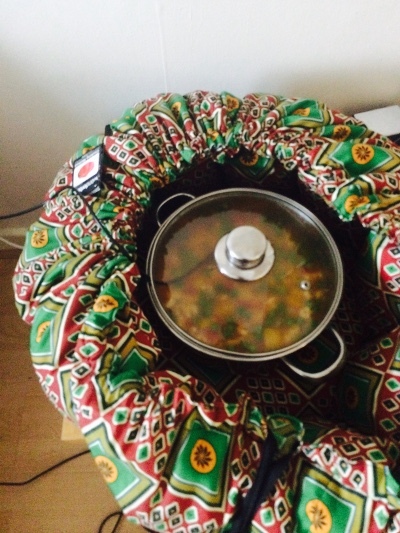 So, with the sensor inside the pot (while the sensor could tolerate the heat in the pot, the cable warped a little), and the wonderbag all closed up, I left the paella to cook for two hours. The meal was completely cooked in that time. Using some published information about rice, since this is a rice dish, it should be kept hot about 63 degrees centigrade [source]. 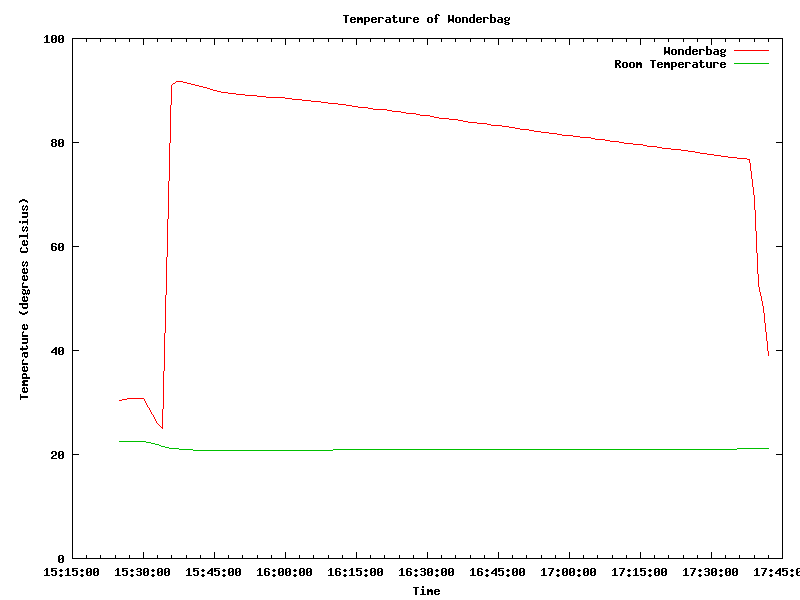 You can see here in the graph that over the two hours the temperature inside the pot dropped from around 95degrees to around 75 degrees, at which point I opened it up and removed the sensor. One thing to note whilst doing this experiment is that the lid on the pot inside the wonderbag couldn't close properly. For the first time since I've had it, I could smell the contents of the pot inside the bag. I do think that by having the sensor inside the bag, it was not able to keep the heat in as well as usual. However, over the course of the two hours, a 20 degree drop in temperature is not a huge amount, especially considering that it will be more than above the 63 degree recommendation for rice in another hour assuming that the linear drop in temperature continues. I will perform another experiment that lasts longer, maybe involving meat and use a different pot that I have with a small vent in the top. This page was last modified: September 11 2015 09:52:07.